Photographers of a thoughtful demeanor should take a keen interest in what we mean by “seeing.” Are there different types of seeing? Does each visual art have a particular mode of seeing? Is there a difference between “looking” and “seeing”? To what extent is seeing different than thinking? The English philosopher Roger Scruton attempted to answer these questions in one of the foundational texts in philosophical aesthetics, “Photography and Representation” (Critical Inquiry 7:3; Spring 1981). Scruton argued that photographs cannot be artworks because, unlike paintings, they cannot “represent,” that is, they cannot “sensuously embody … idea(s)” in ways that give rise to aesthetic satisfaction. 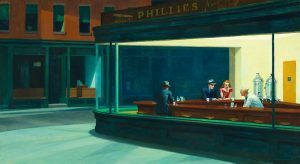 Put more simply, Scruton argued that a painter could inflect within a painting references to further thoughts, as for example one might see into Hopper's painting, Nighthawks, thoughts about loneliness and alienation. Scruton called this type of seeing, seeing as. An obvious way to counter Scruton would be to argue that his conception of the photographic process is too narrow to encapsulate what photographers actually do. Defining the photographic process solely in terms of the photo-chemical or electronic process instigated by a shutter-release leaves out those bits of photography that give expression to a photographer's visualization of a scene. Many philosophers have used variants of this type of argument. Some, however, have argued that it is this very narrow process that makes photography so distinctive from other artistic enterprises. The causal link between photographs and the scenes that they depict gives photography its characteristic charm. But is there not something more fundamental at stake here than mere quibbling about what we mean by photography or art? Scruton cleaves a sharp divide between seeing as and merely seeing. This sharp distinction puts him in an untenable philosophical position: that seeing is inert, incapable of sequestering thoughts by virtue of what is being seen. But what if seeing as and seeing were but two parts of the same process—say, picturing, to give it a different name with a wider connotation? In that case, seeing would not be inert; it would simply be the start of a process called picturing. Its phenomenal (i.e., nonconceptual) aspects would guide the mode of understanding by which we judge things to visually be what they are: objects, say. Picturing would involve a seeing with bare recognition and as we look more closely, the phenomenal content would provide further structures for conceptual shapings by which perceptions come into a process of thought. For Scruton, seeing is causal, that is, merely mechanical. But is it so unreasonable to suppose that seeing is more than this, and indeed not exhausted by conceptual understanding but rather invoking a surplus of sense beyond this, as argued Sellars? The pinkness of the ice-cube has an immediacy and presence that is different than the way it is in thought. If we subtract from seeing pinkness the thought of pinkness, we are left with a remainder that is the phenomenal content of seeing. The conceptual apprehension of pinkness underdetermines what it is. This phenomenal content is nonconceptual and therefore not available to scrutiny through thinking (for to do so would be to conceptualize it). We can only intuit it as the result of transcendentally framing an inquiry into the conditions that must pertain for us to have this immediate experience of pinkness that fades when we leave its presence, for its half-life is measured in seconds. Contra Scruton, a photograph therefore can be seen in terms of an expression of a thought. If we make dubious distinctions between types of seeing— one for painting and one for photography—we get into a muddle. If we look more deeply into this muddle, we see that it comes from a curious habit that many philosophers have of limiting our understanding of things to cognitive understanding, that is, an understanding that involves only propositional content. It seems to me that to restrict aesthetic pleasure only to cognitive understanding is to miss the essence of what a pleasurable thing is. It is to Sellars’s credit that he recognized that there is more to seeing than meets the eye and that the ensuing surplus is phenomenal. It is a shame, however, that he did not question the whole idea of mental representation, but that’s another story. Castaneda Calderon, Héctor Neri, and Wilfrid Sellars. (1975). Action, Knowledge, and Reality: Critical Studies in Honor of Wilfrid Sellars, Indianapolis: Bobbs-Merrill. Sellars, Wilfrid. 1982. “Sensa or Sensings: Reflections on the Ontology of Perception,” Philosophical Studies: An International Journal for Philosophy in the Analytic Tradition: 83. Kant, Immanuel. 1790. Critique of Judgement: 36. Tony Cearns is a photographer and tenkara angler based in Liverpool, England, who is researching the notion of affordance and mood in aesthetics and health. He is not affiliated to or employed by any institution. This is a very good article, thank you. I have a question with regards to “the notion of affordance and mood”. What do you mean? Affordance – JJ Gibson proposed that we perceive possibilities for action (affordances) which are given by the environment. The environment ‘pulls’ actions out of you, as it were. A common example is that a chair affords sitting for a person of the right size, but not for a baby, say. The notion is getting quite a bit of attention, recently by Andy Clark’s Surfing Uncertainty [(2016)], Ruth Millikan’s Beyond Concepts [(2017)] and Daniel Dennett’s From Bacteria to Bach and Back [(2017)]. Mood: ’Mood’ plays an important role in Heidegger’s “Being and Time’. Reading Blattner’s interpretation of Being and Time, Mood discloses the way things matter to us; Moods are atmospheric, that is we are steeped in them rather than they being private interior states; Moods reveal to us how we are faring. It seems like your argument turns on your opinion of the thought/feeling binary, which I would be interested in hearing more about. Scruton, seems to be claiming that photographs cannot represent anything, which is remarkable, because “a photograph of Venice” is NOT Venice, and is merely a 2D section of colored space, except to the extent that we see it as representing (fictitiously) the literal Venice. Not having actually read Scruton’s argument I can’t see how it is interpretable as anything but elitism in favor of his preferred artistic mode. What is Art, though? It seems like your piece counters Scruton, and claims that photographs can be art to the extent that they can “be seen in terms of an expression of a thought.” It appears then that you agree with me that any sensory experience could be the basis of art, but the interesting question to me is how you distinguish between sensory content that is and is not art, given all the means by which we imbue physical structures that convey sensory content with expressions of thought. How do you distinguish art from communication? When I say “It is raining outside,” am I not imbuing sensory content (sounds) in physical structures (vibrating air) with expressions in thought (it is raining outside)? What if I throw a rock at someone from a roof only to see how they will react? Does the thought-content involve “there is a rock hitting you?” Is that not art because all I “send” to them is a chunk of sensory input? But isn’t that chunk necessarily involved with thought, because one always thinks about one’s feelings – at least to some extent? What if I just yell gibberish at someone? Is that performance art? Is the thoughtful content “look at me?” If I place a piece of art in a cave, never to be seen again, is it art? Does it need an audience? I think your argument implicitly rests on the system you take as given that gives meaning to thought and feeling, and art itself. I would be curious to hear how you answer these kinds of questions. I think Scruton’s argument is more sophisticated but your conclusion is correct. 1. All experience (whether aesthetic or otherwise) is the correlation between a subjective consciousness and the structure of objects presenting themselves. Subject and Object are tied to each other in such a way as to make meaningless any attempt to assert a separate existence to ‘Mind’ or ‘Object’ in terms of experience. 2, Similarly, ‘Thinking’ and “Seeing” (or any other sensory feeling) are not independent of each other. When I see something I also have a sense of touching it, for example. Seeing has a haptic quality. I’m not sure what you mean by ‘binary’, but I would say that Thinking and Seeing are interdependent. Seeing and Thinking co-develop in an episode of “Seeing as’. Scruton has Seeing as independent to Thinking. 3: Experience is given in an aesthetic form. Experience is the crystallisation of an aesthetic form (aisthesis) as a concrete event. Aesthetic forms have a gestalt quality and a mode of articulation (affordance and possibility are useful concepts here with which to explore this)). 4. Experience is articulated through language. Language is not only to be seen in terms of a Fregean subject/predicate, concept/object type or solely in referential terms, as in Semiotics. Language is lived as an aesthetic form and has gestalt qualities. 5. Aesthetic forms convey meaning through the complex arrays and hierarchies of properties that constitute gestalt phenomena. 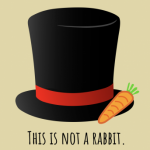 Meaning has little to do with representation and more to do with positional information. Representation is subordinate to the primacy of aesthetic forms. Mereological principles underpin meaning-constituting aesthetic forms. 6. Art is the articulation of Experience as part of a language game, reinforced through institutional norms. I realise I make huge leaps here…. Thank you once again for your input.